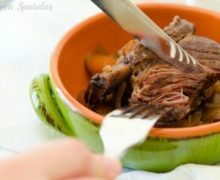 Slow Cooker Short Ribs - Easy Recipe, SO tender and shreddable! 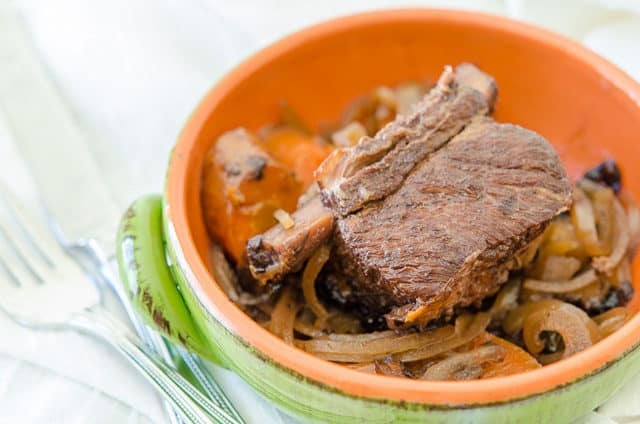 These Slow Cooker Short Ribs are cooked gently in the slow cooker until tender and falling off the bone. They’re flavored with red wine and classic vegetables, for an easy and delicious weeknight meal! The beef short rib is one of the only cuts of meat that you can say almost truly melts in your mouth. It’s unreal how tender the meat is, and it shreds like a dream. It also happens to be one of the best matches made in heaven for the slow cooker. With a little prep, you can combine them with a handful of supporting ingredients and let it cook gently. When slow cookers started becoming really popular, I was a little wary of getting on the bandwagon, but now I’m completely obsessed with crockpot cooking. My spontaneous $15 purchase turned into one of my biggest bang-for-your-buck kitchen items, as I seriously use my slow cooker nearly every day. I make things like this Crockpot Chicken Breast so I always have lean protein on hand for salads, and Slow Cooker Pulled Pork for burritos. 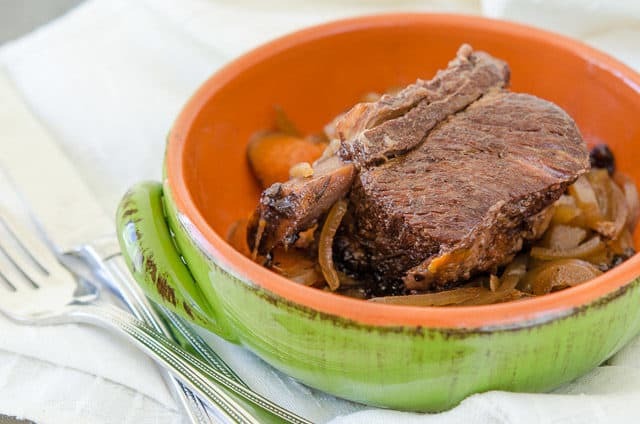 These Slow Cooker Short Ribs are easy enough to be a regular meal as well, and I always make sure to stock up when I see beef short ribs on sale at the grocery store. Just make sure to thaw the short ribs before putting them in the slow cooker, because you never want to cook meat straight from frozen. The first thing you want to do is outside of the slow cooker, but it’s worth it and only takes a few minutes. Add wine, beef stock, and honey, and let the short ribs cook away for 10-12 hours until they’re super tender. 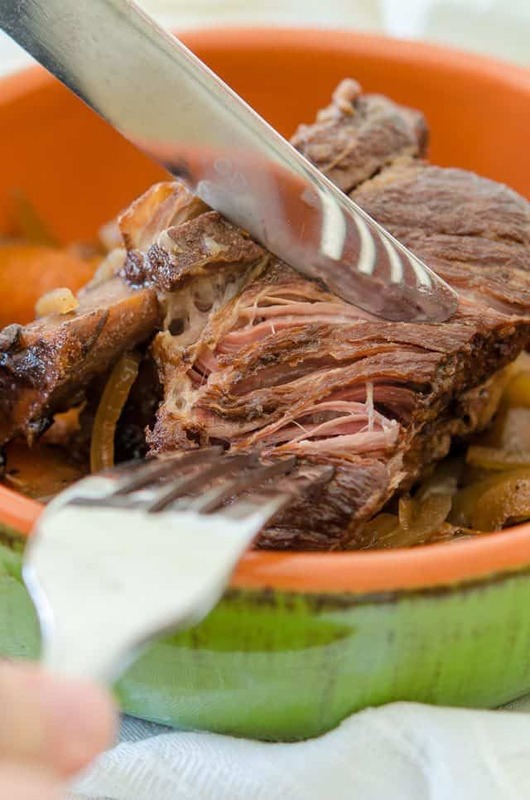 Bone-in Short Ribs are cooked in the slow cooker until tender and falling off the bone. It's such an easy and delicious weeknight meal! Heat up a large skillet (preferably cast iron) over medium high heat, and enough oil to barely coat the bottom of the pan. Sear the short ribs on all sides for about 4 minutes until brown and caramelized. Remove from the heat. 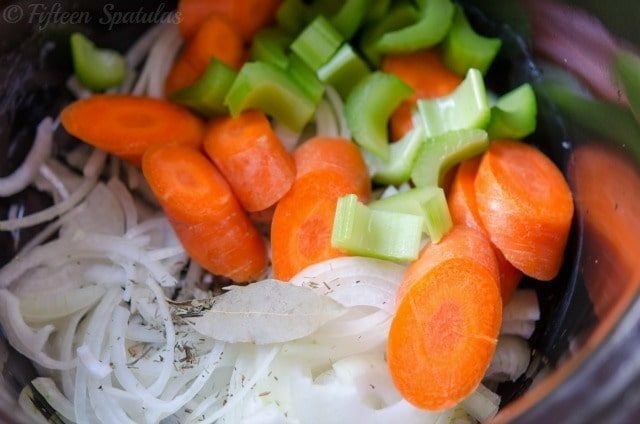 Place the sliced onion, sliced carrot, and sliced celery into your slow cooker pot, and add the thyme, bay leaf, and a big pinch of salt. Toss it all together with your fingers, then place the browned short ribs directly on top of the vegetables. Pour in the wine, beef stock, and honey, and cook on low for 8-12 hours, until the short ribs are tender and falling off the bone. You will be able to narrow this time down when you figure out what works for your exact slow cooker, but once it’s tender it’s ready. Enjoy! 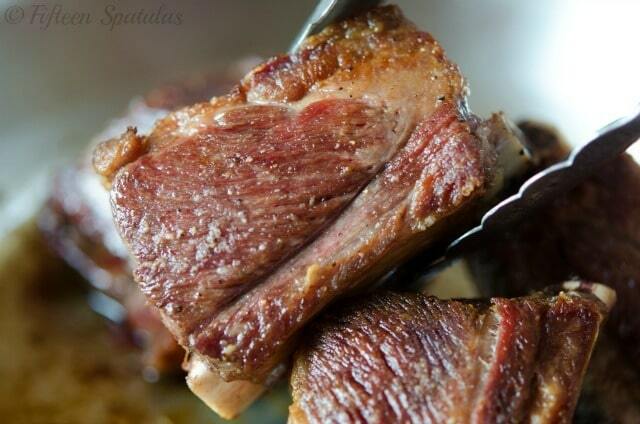 I have only 1.5 lbs short ribs for my husband and I. I would like to use this receipe and am wondering if cooking it on high would be a problem in terms of tenderness and flavor? Hi Betty, it would probably be okay. I’ve done that a few times when in a rush, and it may come out a little drier but it still works, and the meat should come out fairly tender. about how many people would this recipe feed? Hi Valerie, I think it depends on who you’re feeding, but for this recipe I assume that if you have 4 short ribs equalling 2 pounds, that would feed 4, assuming you’re serving this with sides. 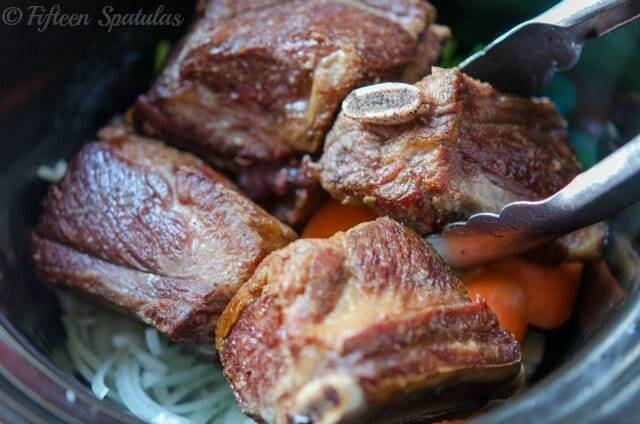 However, you can add more short ribs to the slow cooker if you want to feed more. The liquid doesn’t need to cover the meat, so no need to double everything else. Hope that helps! I made this over the weekend and it came out great. Thanks! I tried this today and it was delicious. There was no direction as to what to do with the sauce, so I blended the veggies with the gravy and added some cornstarch to thicken and heated. This worked very well. I would absolutely make this again! If I double the recipe to 4 lbs do I have to increase the cooking time? If you have a larger slow cooker and the meat can rest in a single layer, then no need to increase cooking time.